Ahram, Ariel I. and Paul Goode, J.. 2016. “Researching Authoritarianism in the Discipline of Democracy.” Social Science Quarterly 97(4): 834–49. Aremu, Fatai and MacLean, Lauren. 2016. “The Challenges of Collaboration among Africanist Scholars Conducting Field Research: Unintended Consequences of the DA-RT Initiative for the Study of African Politics ” APCG Newsletter of the African Politics Conference Group 12(2) 4–5. Bishara, Dina. 8 April 2016. “One of the distinctive challenges that arise when working in authoritarian settings has to do with dealing with changing political situations and the implications.” Challenges to Transparency in Authoritarian/Repressive Settings (Blog). https://www.qualtd.net/viewtopic.php?f=26&t=146&p=857&hilit=bishara#p857. Breuning, Marijke and Ishiyama, John. 2016. “Implementing DA-RT Principles in the American Political Science Review.” Comparative Politics Newsletter 26(1): 54–57. Broockman, David E. and Kalla, Joshua L.. 2016. “Durably Reducing Transphobia: A Field Experiment on Door-to-door Canvassing.” Science 352(6282): 220–24. Cramer, Katherine. 2015. “Transparent Explanations, Yes. Public Transcripts and Fieldnotes, No: Ethnographic Research on Public Opinion.” Qualitative & Multi-Method Research Newsletter 13(1): 17–18. Denzin, N. K. 1978. Sociological Methods. New York: McGraw-Hill. Elman, Colin and Kapiszewski, Diana. 2014. “Data Access and Research Transparency I the Qualitative Tradition.” PS 47(1): 19–24. Everett, Jim A. C. and Earp, Brian D., 2015. “A Tragedy of the (academic) Commons: Interpreting the Replication Crisis in Psychology as a Social Dilemma for Early-Career Researchers.” Frontiers in Psychology 6. 1152. doi:10.3389/fpsyg.2015.01152. Fujii, Lee Ann. 2016. “The Dark Side of DA-RT.” Comparative Politics Newsletter 26(1): 25–27. Gerring, John and Christenson, Dino. 2017. Applied Social Science Methodology: An Introductory Guide. New York: Cambridge University Press. Goode, J. Paul and Ahram, Ariel L.. 2016. “Introduction: Observing Autocracies from the Ground Floor.” Social Sciences Quarterly 97(4): 823–33. Hall, Peter A. 2016. 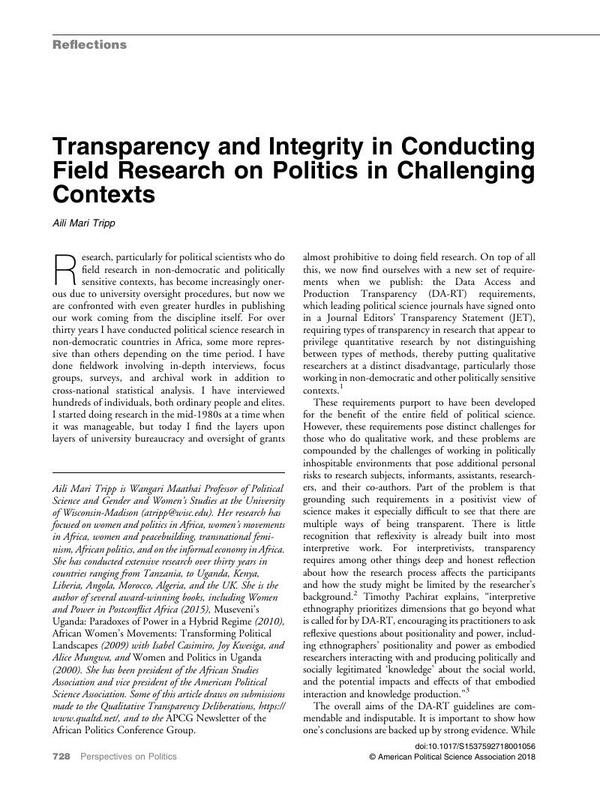 “Transparency, Research Integrity and Multiple Methods.” Comparative Politics Section Newsletter, 32–36. Heywood, Linda. 2011. “Angola and the Violent Years 1975–2008: Civilian Casualties.” Portuguese Studies Review 19(1–2): 311–32. Htun, Mala. 2016. “DA-RT and the Social Conditions of Knowledge Production in Political Science.” Comparative Politics Newsletter 26(1): 32–35. Kapiszewski, Diana, MacLean, Lauren M., and Read, Benjamin L.. 2015. Field Research in Political Science: Practices and Principles. New York: Cambridge University Press. King, Gary, Keohane, Robert O., and Verba, Sidney. 1994. Designing Social Inquiry. Princeton, NJ: Princeton University Press. Loycle, Cyanne. 2016. “Overcoming Research Obstacles in Hybrid Regimes: Lessons from Rwanda.” Social Science Quarterly 97(4): 923. Lynch, Marc. 2016. “Areas Studies and the Cost of Prematurely Implementing DA-RT.” Comparative Politics Newsletter 26(1): 36–39. Pachirat, Timothy. 2013. Every Twelve Seconds: Industrialized Slaughter and the Politics of Sight. New Haven, CT: Yale University Press. Pachirat, Timothy. 2015. “The Tyranny of Light.” Qualitative & Multi-Method Research Newsletter 13(1): 27–31. Pawson, Lara. 2007. “The 27th May in Angola: A View from Below.” Revista Relações Internationais 4. Piscopo, Jennifer. “December 2, 2015: Jennifer Piscopo expresses her concerns about conducting elite interviews and the widening gulf between the “haves” and the “have-nots” under DA-RT.” In Dialogue on DA-RT (Blog). https://dialogueondartdotorg.files.wordpress.com/2015/12/piscopo-dart-v2.pdf. Schatzberg, Michael. 1986. “Two Faces of Kenya: The Researcher and the State.” African Studies Review 29(4): 1–15. Shih, Victor. 2015. “Research in Authoritarian Regimes: Transparency Tradeoffs and Solutions.” Qualitative and Multi-Method Research 13(1): 20–22. Snyder, Jack. 2014. “Active Citation: In Search of Smoking Guns or Meaningful Context?” Security Studies 23(4): 708–14. Straus, Scott. 2012. “Challenges of Research in Rwanda: An Interview with Scott Straus.” Newsletter of the African Studies Association. Tripp, Aili Mari. 2015. Women and Power in Postconflict Africa. New York: Cambridge University Press. Weller, Nicholas and Barnes, Jeb. 2014. Finding Pathways; Mixed Method Research for Studying Causal Mechanisms. New York: Cambridge University Press.